Patterson meets the country’s worst home renovators as they show him their ridiculous – and sometimes ingenious – attempts to repair their homes. The result is nothing short of appalling: missing load-bearing walls, plumbing fixed with duct tape, cabinets built in front of windows and lots of spray foam that’s actually keeping some houses from collapsing. But this is a rescue mission. 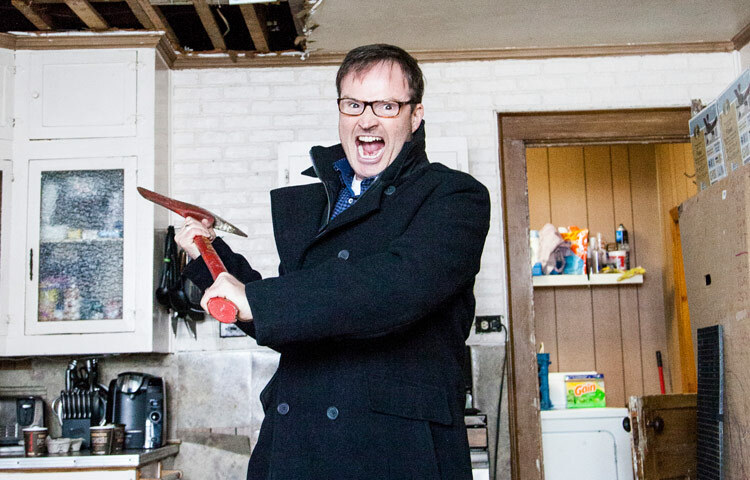 All of the homeowners get a phenomenal renovation led by award-winning contractor Dave Rannala and his talented reno team, which includes top-notch carpenters (and prank-loving brothers) Andrew and Matt Carson. You need a license to drive a car but you don’t need a license to own a home. I Wrecked My House hits home that point by featuring homeowners who have quite literally wrecked their houses. New episodes will air Tuesdays at 10pm ET/PT, followed by an encore episode from the previous week at 10:30pm ET/PT. Steve Patterson is a three-time Best Comic award-winner, best known for the wildly successful radio show, The Debaters and comic juggernaut, Just for Laughs. He has just launched a new comedy tour, I Laugh Therefore I Think.